Illness is eventual and cannot be prevented’ – Today, this old school of thought holds no truth whatsoever. In fact, all disease can be treated and even prevented in some cases, if detected early. At the Aditya Birla Memorial Hospital, Wellness Assessment Centre, we undertake exhaustive investigation, testing and detailed analyses of patients and their family history, in order to provide comprehensive reports and recommend appropriate treatment for a healthy life. Our teams of highly trained physicians, aided by our sophisticated NABH accredited laboratory and state-of-the-art machinery, identify the minutest signs of disease and help terminate them at the onset. Today’s stressful lifestyle of long working hours, irregular eating habits and inadequate rest, can lead to severe health problems. Preventive check-ups and timely treatment will help ease stress and save money from catastrophic health problems. Our wellness packages are designed to include programs that undertaken preventative health screening test, and identify and recommend treatment in case of diseases. A coronary risk profile is targeted at identifying atherosclerosis – a disease of the arteries characterized by the deposition of fatty material on their inner walls. The profile can help determine your risk of heart disease. While heart attacks are not confined to only those with family history, such people are particularly vulnerable to coronary diseases. Therefore, it helps to know in advance the risks you are facing so you can take preventive measures or treat the disease in time as the case may be. 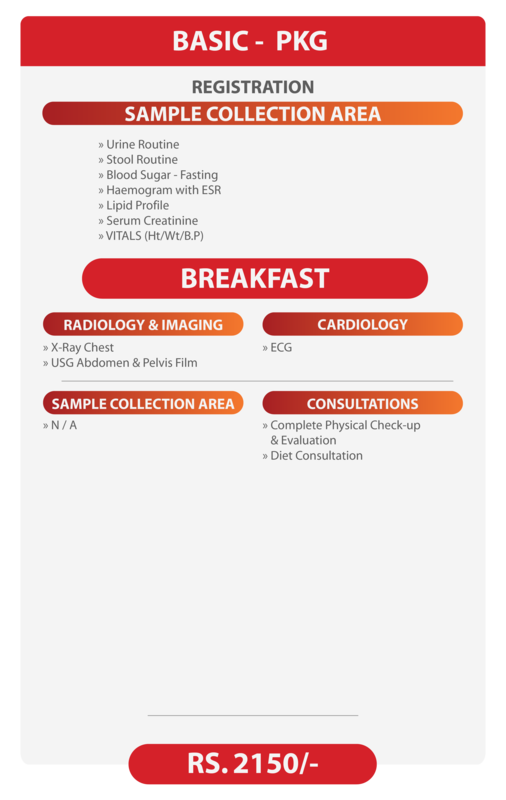 For this after a thorough clinical examination by a physician, blood tests, ECG, Chest X ray, 2D ECHO and Stress test are performed. After which our experts analyze the reports, recommend preventive measures and facilitate necessary treatment if any. For an Executive, stress is a direct outcome of today’s fast paced, competitive world. This lifestyle adversely affects your health in more ways than you can imagine, thereby making good health a criticality. It is therefore absolutely essential that you undergo an exhaustive health checkup at the earliest even if you feel normal and healthy. This would determine your exact health condition and help take measures to improve efficiency, alertness and productivity – qualities important for an Executive. Our team will guide you through several tests that will enable us to determine the best course of action for you to maintain a healthy lifestyle. Those between 30-60 years of age, and have an unhealthy lifestyle e.g. if you smoke or chew tobacco, are overweight, diabetic, hypertensive, or if you have a family history for the same then the Comprehensive package is designed for you. Our physicians will investigate, test and diagnose your reports and design and recommend appropriate lifestyle changes for a healthy and stress free life. It is at this stage of life that early warning signals of ill health appear. Addressing these warning signals can prevent a full blown disease, thereby saving you and the family from the stress and money. With increasing age the cost of healthcare increases manifold and becomes a burden on the individual and the family. Early intervention helps in preventing catastrophic cost and stress. Elderly individuals are the ideal candidates for this package. The package concentrates on consultations with Physician, Gynecology, Ophthalmology, ENT, Orthopedician and Dentist. Additionally, test related to the heart, lung, liver, kidney, diabetes, cancer, degenerative diseases and deficiencies are also carried out. For senior citizens, a Wellness Assessment Package is a good way to show you care about their health. Young dynamic overworked and overstressed individuals need the system in perfect condition. If you are not comfortable with your routine, if your efficiency seems to be compromised and if you have any trivial health issues, this package will help identify the abnormality and proceed to treatment and well-being. This test addresses body abnormalities that occur at this stage of life. Hypertension is rightly described as a silent killer as it has no symptoms and comes unannounced. It is a chronic medical condition that can bring about many complications if left unattended. This package is critical to confirm if you have high blood pressure, check for its effects on the kidneys, heart, blood vessels, and determine if you have risk factors for heart disease or stroke. Whether you are a working woman or a home-maker, multitasking eventually takes a toll on the health. Besides the usual parameters the Well Woman Check-up Package includes crucial test like, Gynecological check, Pap smear and Mammography – test that are critical for all women. This package is specially created to meet the needs of today’s women. 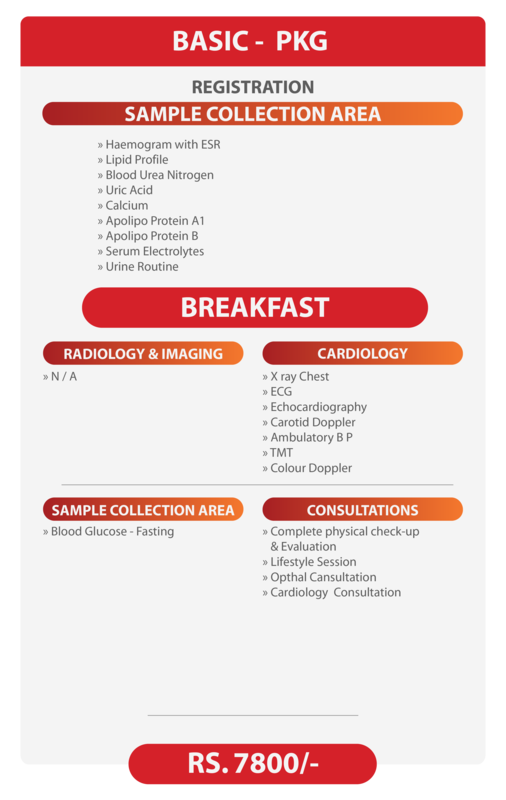 You are a person with absolutely no health issues, no risk factors but would still like to know your basic health status at a minimal cost, then this package is tailor made for you. It consists of a preliminary screening test of the heart, lungs, liver and kidney function. Additionally, we also check on the status of your diabetes and cholesterol as a bonus offering. In order to reduce wastage of man-hours on illness and enhance efficiency, employers often want to know the fitness status of a prospective employee. Depending upon the working conditions, corporates chose a package best suited for their environment. On completion of any check-up a Health Summary is shared with the patient. This summary highlights even the smallest possible clinical, biochemical or imaging abnormalities. It is then analyzed and discussed with the patient, after which suggestion for further follow-up or dietary changes or lifestyle modification or medication is recommended and provided as the case maybe. Finally the physician conducts a post investigation consultation that results in Primary Prevention, where the physician advices proven methods to halt the progress of those abnormalities – thereby preventing a full blown disease. In case of Secondary Prevention, where the disease already exists, the physician recommends procedures or lifestyle changes to prevent its complications.